Wei-Yin Chen limits the Yankees to two runs in a strong start. The New York Yankees are making their pursuit of home field in the AL wild-card game a little more difficult. 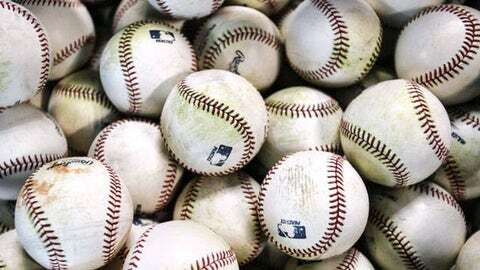 Ivan Nova allowed five runs in another shaky start, a 9-2 loss to the Baltimore Orioles on Saturday in the opener of a split-doubleheader. Tuesday’s one-game playoff would still take place at Yankee Stadium if the Yankees (87-73) defeat the Orioles in the second game or if Houston (85-75) loses at Arizona later Saturday. Otherwise, home field will be on the line in Sunday’s regular-season finales. Yankees manager Joe Girardi split his regulars between the first and second game. Center fielder Brett Gardner was the only lefty that faced the left-handed starter Wei-Yin Chen (11-8). "I think the one thing that tops home-field advantage is health," Girardi said. "Playing guys two games today, to me, is risky in a situation like today, when it’s cold and wet and rainy." Baltimore’s Gerardo Parra had four hits and three RBI. Manny Machado had his 34th home run, off Nova (6-11), and also drove in three runs, and J.J. Hardy had three hits for the Orioles. New York right-hander Luis Severino will start the late game against Ubaldo Jimenez. In the final start of his first season since Tommy John surgery, Nova allowed eight hits in 5 2/3 innings, walked three and hit a batter to raise his ERA to 5.07. Cardinals: Can they shake their September struggles? 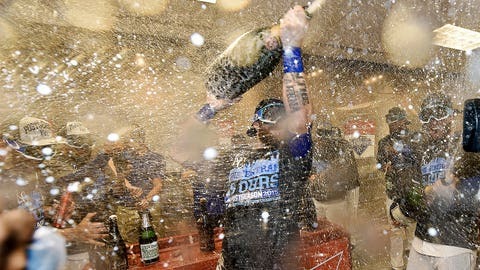 Royals: Can KC finish what it started last postseason? Cubs: Is this young core ready to win that elusive title? Blue Jays: Can offense bash way to championship? Mets: Drought is over, but are they really contenders? Dodgers: Can LA finally get over NLCS hump? Rangers: Will #Nevereverquit attitude continue? Astros: How far can all-or-nothing youngsters go? "I’m not talking about Tommy John anymore," said Nova, who is 0-4 with a 7.20 ERA in his last four starts. "It has been over and over, like every start. You know, I didn’t pitch good in the regular season. It’s the only thing I can say about it." It was still only 2-0 before Machado hit Nova’s 1-2 fastball into the Orioles bullpen with two outs in the fifth. Machado added an infield RBI single when Chasen Shreve relieved Nova during a four-run sixth. Parra singled in a run in the sixth and drove in two more on his second double of the game in the seventh. 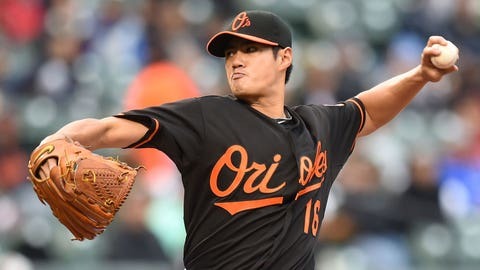 Chen allowed two runs in six-plus innings in what could be his final start for the Orioles, striking out three while allowing four hits and three walks. A pending free agent, the 29-year-old from Taiwan finished the season with a 3.34 ERA. He’s 46-32 with a 3.72 ERA in four seasons with Baltimore. "I will be happy if I get given the chance to come back here," said Chen, a client of agent Scott Boras, through a translator. "But sometimes as a professional player, sometimes it’s inevitable that you have to change team and adapt to a new environment." Rico Noel reached on an infield single in his first big-league plate appearance, a month after he came within moments of reaching the plate at Fenway Park. A September call-up who has been used primarily as a pinch runner with New York, Noel was on deck Sept. 2 when Girardi sent up Jose Pirela to pinch hit for him. The Yankees led 12-5 in the eighth inning. On Saturday, Noel batted for Pirela leading off the ninth and hit a 60-foot bouncer to third off Oliver Drake, reaching first without a throw. "I’ve been waiting for it for a long time," the 26-year-old Noel said. "To get in there and get a couple hacks out of the way, after not seeing pitching in forever, get the hit out of the way in the first at-bat, it’s unbelievable. It’s as good as it gets." Shreve allowed two runs while getting just one out as he continues his late-season struggles. The rookie left-hander has allowed nine runs in six innings (13.50 ERA) since Sept. 1, raising his overall ERA more than a run in that stretch to 3.09. "I’m going to put him back out there tomorrow if the situation presents itself," said Girardi, who added that he’s unsure if Shreve could make New York’s wild-card squad. "We’ll put the roster together when we need to. I don’t need to do it tonight. But the big thing is we still try to get him going." Yankees: 3B Chase Headley (back stiffness) was in the lineup for Saturday’s first game. … OF Jacoby Ellsbury (back stiffness) was expected to play the second. Orioles: 2B Jonathan Schoop will have a follow-up exam later Saturday on his bruised right hand. "He’s getting a fluoroscope – I don’t know if that’s the right word, but it’s a sort of next-step X-ray," said manager Buck Showalter. Yankees RHP Michael Pineda (12-9, 4.24) looks for his third win in four starts Sunday against Orioles RHP Chris Tillman (10-11, 5.05), who last finished a season with an ERA of five or higher in 2011.